From among the best total solar eclipse images. 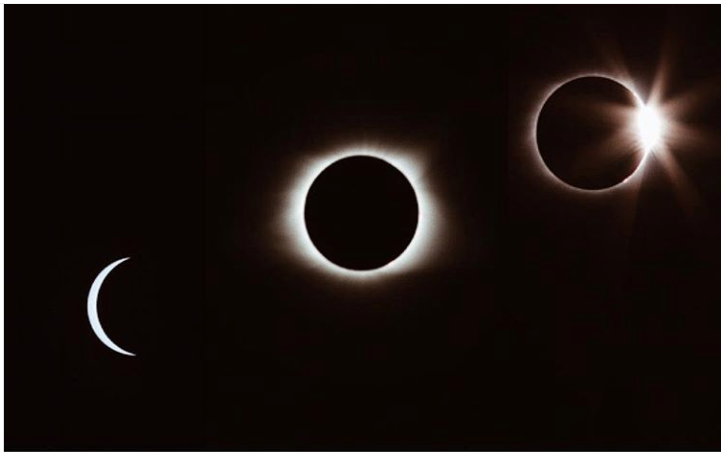 This solar eclipse series pilfered from photographer Jeffrey Johnson on Instagram. "Path of Totality"?!? Would seeing the total August 21, 2017 solar eclipse "in the right spot"* live up to the drama of its name? *Only those in a specific 70-mile swath would see 100% of the sun occluded by the moon -- the darkness of a full solar eclipse. Try to imagine an era back before mankind understood what caused this strange, natural but relatively infrequent phenomenon. How truly frightening watching the sun get blotted out must've felt! Were the Gods angry? How could humans save themselves from the darkness? In light of modern astronomy, these fearful notions strike most of us as quaintly amusing. Farmer's Almanac gives a great round-up of solar superstitions from the days of yore. Well, you're where you should be all the time..."
Here in Portland Oregon -- just a stone's throw from "The Path of Totality"(full solar eclipse) -- I didn't have to head very far to see the total eclipse. But by the time the 30th or so West Marine customer asked if we had any eclipse glasses (we didn't -- and the question came up easily 100 times) I was totally over the eclipse well before its arrival. Little else filled NPR's airwaves for a whole week prior (admittedly a refreshing break the controversial and tragically violent Charlottesville protests over the removal of General Lee's statue). "Oregon is planning on and influx of one million visitors to the state to watch the eclipse -- get to your viewpoint early!" warned the news media for those concerned about not wanting to get mired in traffic and finding their special place. One million visitors -- the planning estimate from Oregon's Office of Emergency Management -- would equate to a 25% bump in the state's total population. A place where everyday traffic is already terrible. One of the many solar eclipse souvenirs available. Add to that the off-putting dynamics of opportunism (besides the much-sought-after eclipse glasses -- which came "free" with a $50 bottle of Mont Gay Eclipse rum from the local liquor store). 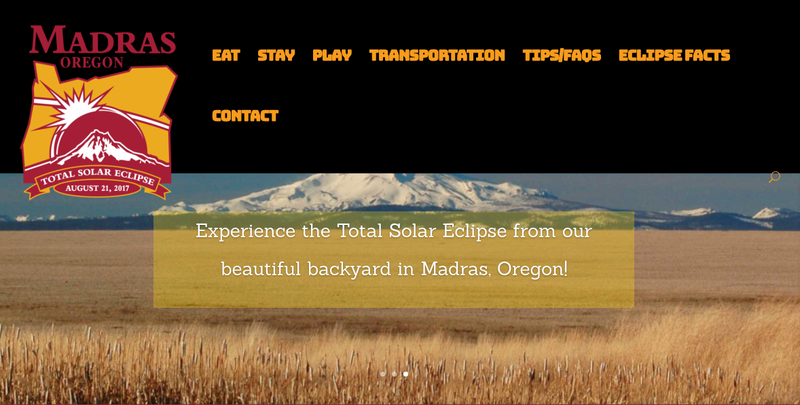 Madras, Oregon, capitalizing on its ideal location for the total solar eclipse. 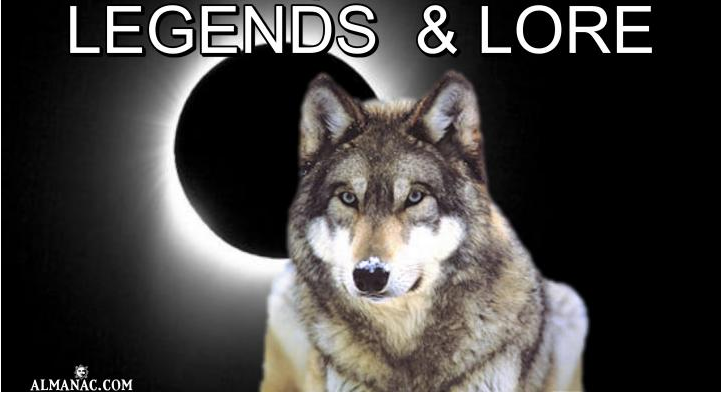 The high desert of Madras, in central Oregon, one of the state's more typically sunny spots and one of the places deemed to be an ideal eclipse-watching spot, reports were that a 4-day campsite would set you back $1000. Mashable's eclipse post reported that for a site that normally books for $20, campers were paying $300/person, if they shared it with 6 people. Hotel rooms and even AirBnB of course cost even more still, with $1,000/night rooms in the zone not unheard of. The eve before the eclipse, Gunnel, my mother-in-law, her eyes alight, fondly reminisced "There was something really special about when I saw the total eclipse as a child. I'll never forget it." Wayne and I were at her place for dinner, joining her daughter, who chose the eclipse as a good excuse to visit from Southern California. Gunnel wanted the full eclipse experience. No 90-something percent for her. Besides, she theorized, if most folks already arrived at their spot, we were within only one to two hours drive if "totality" from Portland. Given I had the next day off from work, and Gunnel, the former travel agent, consummate planner and possessor of a spare pair of eclipse glasses (hers came from Fred Meyers for $1.99), I asked if I could join them. They welcomed me, and we set the time for a 6 am departure; four hours and twenty minutes from the two-minute wonder's occurrence. On the blissfully sunny morning of August 21st, 2017, we headed South to Silverton, Oregon. Thankfully, the traffic was slightly lighter than normal commute traffic. All the "get there early" solar-eclipse traffic warnings ultimately led to a relatively light commute -- to the eclipse zone. We arrived in two hours. Silverton, aware of its celestial appeal, was rife with totality t-shirts, totali-tea and other commemorative brick-a-brack. The towns coffespots hummed with happy humans, and the line outside the town's sole open breakfast joint, Gather, bespoke its name with a line trailing outside its entrance. 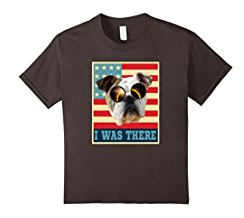 "Did you come from very far to see the eclipse?" asked a silver-haired gent also awaiting his cuppa. "Just a little bit, from Portland," I replied. "You?" He smiled. "From London. We'd planned to come to America... sometime. Seemed like a good time to do it." Solar eclipse watchers settle into the park in Silverton, Oregon. We wandered about town, past the park where better prepared celebrants brought chairs, blankets and sleeping bags. Eventually we chose a clear-view spot against some storefronts, with a small table and two vacant chairs, and a narrow brick window-front ledge that offered a partial seat for the rest of us. And waited. 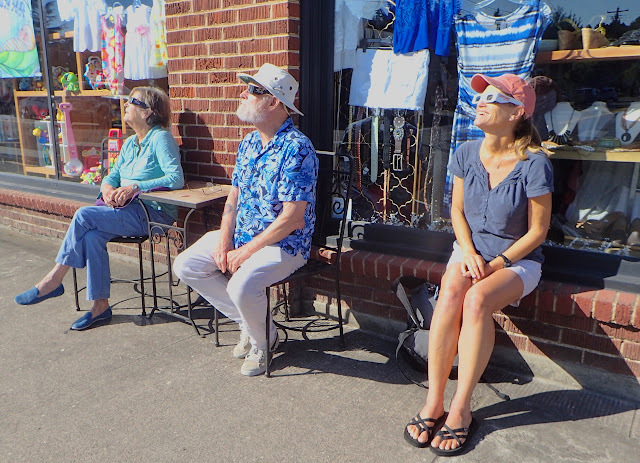 Gunnel, Phil and Inger gaze at the total solar eclipse in Silverton, Oregon, properly protected in their solar glasses. As the light waned, even before the moment of totality, we felt the temperature drop. Inger, Gunnel's daughter and I both noticed the chill, wondering aloud if it was our imagination. Was it simply the lack of sun reflecting on the window behind us? Or something more … ethereal? News reports later said the temperature dropped about 12 degrees F.
Then, though it was a little after 10 am on a bright, clear morning, the dimness-triggered store spotlights above us lit, followed by the streetlights. “Two minutes” came a countdown shout from across the street. A dusky dim, not-quite-dark, descended. Traffic stopped. Breaths were held. There was silence. In unison, eclipse glasses properly in place, we gazed skyward, at the spectacle unfolding before our eyes. The last glowing orb of the sun disappeared, only slightly flaring behind the roundness of the moon. It was not dark enough for stars to be visible, but there was a chilling sense of other worldliness, a reminder of our tenuous existence, our reliance upon the sun, that fiery life-sustaining force nearly 150 million miles away. The full eclipse lasted less than two minutes. In the semi-darkness, the silence was broken as cheers erupted all around even before the sun re-appeared as nature's dimmer switch began its reversal. Crooked Finger, our intentional long-cut when we attempted to outsmart the crowds exiting the Silverton area after the solar eclipse. While the PacMan like occlusion of the sun would continue for another hour, we foolishly decided to beat feet before everyone else blew town. Unfortunately, that philosophy was shared by far too many others! No matter what back roads path we chose every thoroughfare we hit landed us back in stop-and-go traffic. An unintentional long-cut through Crooked Finger didn't help, though it did yield some lovely views. Even if we wanted to use a smart phone traffic app to navigate, despite cell phone providers stepping up capacity coverage, all our phones were jammed. Finally, at 4:20 pm we were home. An 8 hour drive; 10 hours set aside for 2 minutes dusk-like darkness. Was it worth it? It was worth it not only for two-minute astronomical wonder, but for the shared experience, for those that were with us watching, in Silverton, and across the continent. For those whose plans prevented them from seeing the eclipse there was the need to share this all-too-brief bit of history, what it felt like, what it was, what it wasn't. On a metaphorical level, for me, it was a lesson in perspective. For the many of us struggling to find our way in the world, we often see ourselves as isolated and alone. Yet we are not. We are amidst a sea of humanity. If or how we choose to engage is up to us. In the midst of darkness, it is not the sun that's gone away, but our focus on the darkness in front of us at the moment. The darkness does not last forever. Instead, how we view our lives is as much a matter of perspective, whether we choose to focus on ourselves, or upon "the light at the end if the tunnel" and the greater universe around us. This moonwalk across the sun was the last I will see in Oregon in my lifetime, as the next is over a century out. There are of course other eclipses coming up sooner elsewhere in the world. I will not chase them, though who knows if they will happen to occur near where I am anyway. Life is full of surprises. For those of you hoping this post would be full of killer total solar eclipse images, check out this. Or this. Or this. I chose to leave the photography to others, and focus more on simply being there, and absorbing the moment rather than capturing it on film. For those whose photo timing, equipment and skills filled the gap for the rest of us, thank you. We observed the eclipse in Silverton, Oregon (N45.0.24 W122.46.57), though our journey there and back was out of Portland, Oregon (N45.47.449 W122.47.189), where the new-to-us Puget Trawler Serendipity docked there is home. While there are still many GalleyWenchTales to tell of our journeys, we're still settling into our new home. Meanwhile, this post is a good reminder that adventures happen everywhere for those of us open to embracing them.